Residents from the Commonwealth of Puerto Rico fleeing the devastation wrought by Hurricane Maria are among the hundreds arriving daily in Central Florida to start new lives. The Orlando community, with one of the largest Puerto Rican populations in the U.S. outside of the island, is offering support, assistance and relief from the life-changing disaster brought on by the storm’s strength and fury. With a community that’s on track to surpass New York as the state with the largest Puerto Rican population, the opportunity for evacuating Puerto Ricans to contribute to the region’s growing economy is considerable. A recent release from the Florida governor’s office reports the influx of new Puerto Rican residents has already reached 139,000. A more conservative estimate resulting from an October 2017 report by the City University of New York’s Center for Puerto Rican Studies (Centro) statistical simulation projects an estimated flow of 40,998 to 82,707 persons to Florida in the first year following the hurricane. 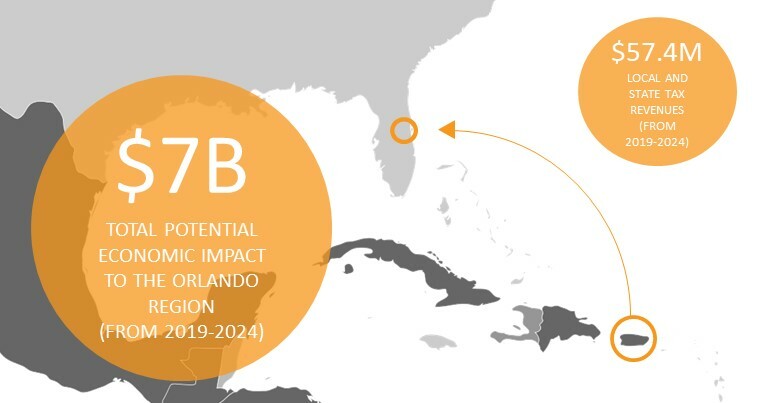 The Orlando Economic Partnership’s Research team can estimate the economic impact corresponding to the integration of the new Puerto Rican workforce by utilizing IMPLAN’s input-output model and data from Centro. Centro projects a Puerto Rican workforce of 47,175 working-age adults (25 – 64 years old) entering Florida in the first year with an estimated 80% of those choosing to take residence in the Central Florida region. It is assumed that 50% of those in our region will find employment in 2018 with 25% expected to find employment in 2019. The remaining 25% are assumed to return to jobs in Puerto Rico or move to other states. Economic impact is based on direct benefits created by increased wages in each of four regional counties—Orange, Seminole, Osceola, and Lake—based on the influx of new workers assumed to earn the average wage in their respective county of residence. Results project a total economic impact of more than $7 billion in the first six years (2019 – 2024), generating local and state tax revenues of nearly $57.4 million over the same period. These estimates do not take into consideration economic activity associated with Florida-based companies’ participation in Puerto Rico’s rebuilding efforts or indirect and induced benefit resulting from the increased payrolls in each county. In the context of continued demand for talent tied to the projected 444,432 job openings expected to be created in Central Florida between 2016 – 2024, its clear the Orlando region’s new Puerto Rican residents will help the economy grow (Florida Department of Economic Opportunity). And the talent pipeline extends into the future with as many as 15,408 school-age children (5 - 17 years old) and 8,847 college age persons (18 – 24 years old) also expected to relocate to Florida who will be able to meet the needs of companies for years to come. ¡Bienvenido a la región de oportunidad!